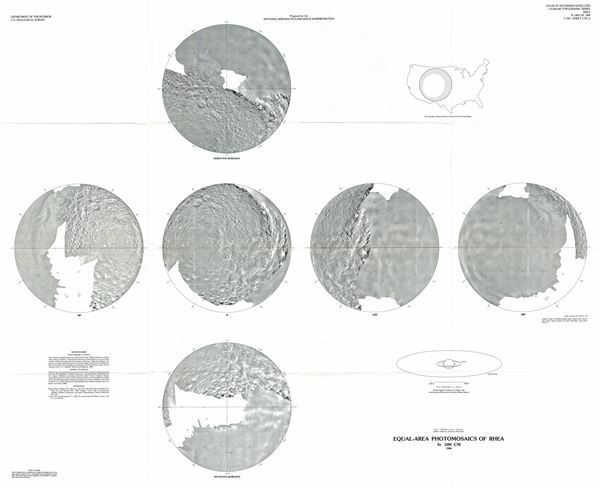 This is a fine example of the U.S. Geological Survey's 1988 map or photomosaics of Rhea, Saturn's second largest moon. The map features six equal-area photomosaics on the Lambert azimuthal projection. These include the South Polar Region and the North Polar Region. A diagram of Rhea relative to the size of the United States is included in the upper right quadrant, while the lower right quadrant features a scaled diagram of Saturn, its major rings, and the orbit of Rhea and of the Earth-Moon system. The image processing and mosaic compilation for this map were done by Ella M. Lee. This map or photomosaic was prepared for the National Aeronautics and Space Administration and published by the U.S. Geological Survey as Atlas of Saturnian Satellites Topographic Series Sr 10M CM map I-1921 sheet 2.